Whether you're shopping for BMW parts or a BMW enthusiast, you will often see chassis and engine codes referenced in place of model years or model names. These codes differentiate the various models even when they share the same name - a 2001 325i (E46 chassis) is not confused with a 1995 325i (E36 chassis). Understanding the BMW nomenclature and chassis codes has become even more vital with the recent expansion of BMW models and body styles. Understanding your chassis code, and to a certain extent your engine code, will aid in shopping for the correct parts for your car as well as keep you engaged in the BMW ownership experience. BMW started using these codes in the 1960s as they were planning their next few product cycles. They started with the letter "E" as it stood for "Entwicklungcode", which is the German translation of "development code". All production models, and even some concept and development projects, get a code with the first production car being the E10 1600/2002 model released in 1966. The E3 sedan has the lowest production code but was released in 1968. I have never seen what the E01 chassis was. By the late 2000s BMW was running out of E numbers. The last E chassis was the E93 3-series convertible in 2007. 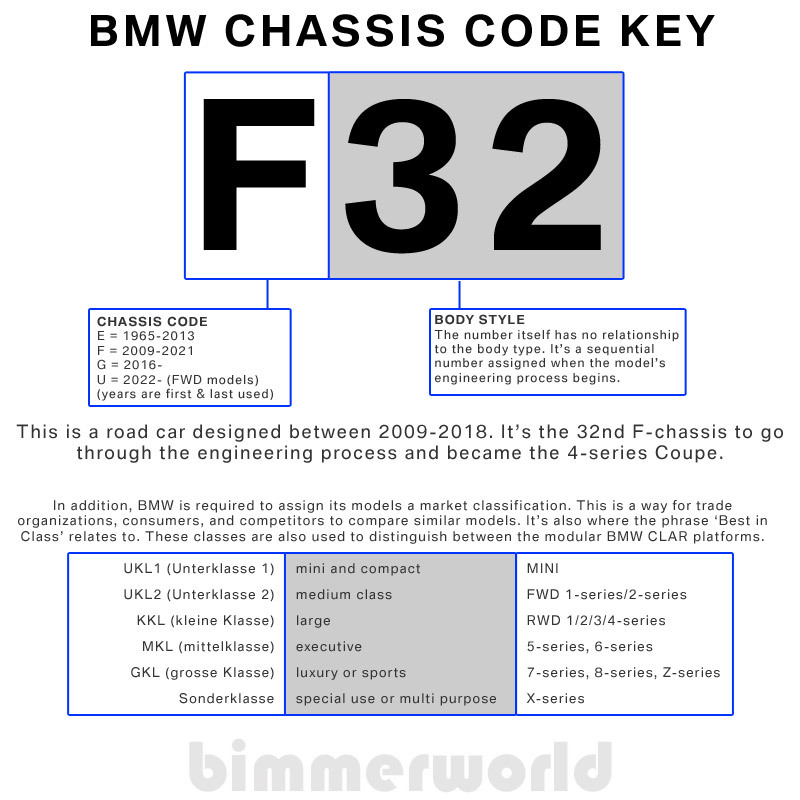 BMW logically moved into F codes beginning with the F01/F02 7-series in 2009. But while we had 40 years of E codes, the F chassis lasted barely seven years when the G11 7-series made its debut in 2016. Even with the proliferation of new BMW models and body styles, it's not obvious why BMW used up so many F codes so fast. They did not use all alpha-numeric "F codes". When the "i" hybrid/electric models were released in 2014 they received new i chassis codes, which will make things interesting in a few years when the H chassis codes are used up. There is no logic to BMW chassis numbers (unlike engine codes). The codes run sequentially with new models getting whichever code is available. Sometimes older codes appear after later ones have already been released (product launch delays or longer development times). 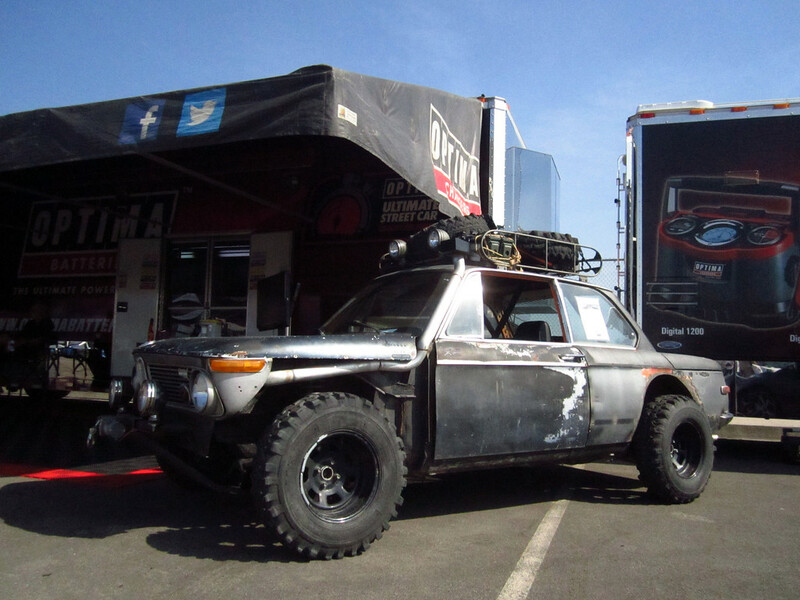 The E codes used to always refer to the chassis, regardless of body style above it. But beginning in the mid-2000s the varying body styles received their own E code (the E60 sedan and E61 wagon). The below table includes all past and current BMW models, and also some models that are planned for the immediate future. "LCI" refers to Life Cycle Impulse, otherwise known as a facelift. BMW made major revisions to the to freshen the appearance and breathe new life into an older model. BMW model years traditionally begin in September of the previous year. A 2012 328i would be released in September, 2011 (9/2011). However, BMW often "pre-releases" models earlier in the year, especially for facelift (LCI facelift) or for major updates. This is usually done in March or July. For example, the 2011 E92 335i, which received the new N55 engine, was released in 3/2010 but as a 2011 model. For BMW engine codes, click here. The rest of this page is a listing of all BMW models and their engines for the US market (along with a few interesting Euro models). This should be especially helpful when shopping for BMW parts or material to use as BMW trivia!